On Sunday, May 3rd, 2015 Team Fastrax™ will be performing as part of the opening ceremony of the GEICO 500 NASCAR Sprint Cup Series race. 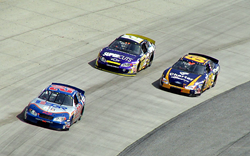 The race is held at the Talladega Superspeedway in Lincoln, AL. We are honored to be performing our patriotic American Flag skydive at such a thrilling event. The GEICO 500 is a hugely competitive race, and it’s sure to be an exciting weekend. The GEICO 500 is a NASCAR Sprint Cup Series race held at the Talladega Superspeedway in Lincoln, Alabama. Defending race winner Denny Hamlin will battle it out with Dale Earnhardt Jr., Jimmie Johnson, Kurt Busch, Kevin Harvick and all of the stars of the NASCAR Sprint Cup Series. Team Fastrax™ will be performing an amazing patriotic display with 3 large American Flags ranging in size from 500 to 2,500 sq. ft., to start the race. This performance of Team Fastrax™ is sponsored by PEAK Antifreeze & Coolant, whose parent company, Old World Industries, is an independent, family-owned business that has been a leader in the development and distribution of high-quality automotive products for over four decades. Great products. Great prices. Do right by your ride and your wallet. Click here to find PEAK products at a store near you. For more information on the race, or to purchase tickets visit the Talladega Superspeedway website.